Good Evening everyone! I hope that the day brought you happiness and all things good! I was just telling all of you on Facebook how I was listening to the song of nature. I still am while I type this blog up. (I am a little behind). It reminded me of how cluttered life can be. With sounds, with nonsense, with negativity and with chaos. I threw it all away today! It kinda of feels refreshing! Anyway, as I try and relate that first random paragraph to the dish I am sharing with you. I think about how cluttered our food lives can be. How over the top thing can get. Sometimes we just feel like getting back to basics. You may notice that is kind of how I roll with food. Oh, of course I love my share of fancy food, but real families, real lives, and real budgets don't always allow for buying fancy ingredients or going to fancy places to eat your luxuries in food. When my husband and I were first together and I would cook things like mashed potatoes and gravy or roast or fried chicken he always say it was "farm food". Ironically I grew up in a tiny town, but not a farm. It just was homecookin' in my world. 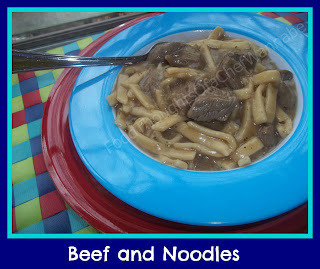 This homestyle beef and noodles is just that. Good ol' home cookin'! You know I love all things that involve the word "noodle". It is my greatest culinary weakness. But this is a one pot dish that will warm you from the inside out. It is creamy, hearty and so good, you will be glad this recipe will feed an army. Leftovers are just as fabulous. (although you may want to add a splash of stock when you reheat the next day to get more of the gravy feel). Like I mentioned this recipe will feed an army and you may want to half it. OR you may want to put some in the freezer for a later meal. I also took some help from the store tihs time. Normally I would make homemade noodles, they are easy peasy and no problem at all. BUT, some of you may or may not know about my recent pasta roller/kitchenaid mishap.........*grrrr*. So I did use the homestyle pasta from the freezer section of the grocery store because I think dried egg noodles are great, but not my first choice for this dish! If you decide to use egg noodles it is still going to be fabulous, because let's face it, I wouldn't share bad food with all of you! Just a personal preference for this particular dish. Btw, your store will likely have a store brand of these noodles which are exactly the same, so save yourself some moola if you buy them! 3 pkgs of frozen noodles or 2 large bags of egg noodles. In a LARGE pot, add in olive oil and butter. When it is melted, add in cubed beef. Salt and pepper. Toss for 3-5 minutes in the pan until cooked through, or very close to cooked through. (if you like rare beef, cook less). Remove from pot unto a plate. Add in 7 cups of stock, 2 cups water, 1 T of pepper and salt to taste. You want your broth seasoned well before the pasta goes in, so it will flavor the pasta well! While you are waiting for it to come to a boil, add cornstarch to your reserved cup of stock. Mix thoroughly. Set aside. When stock boils, add in noodles. Let cook 3 minutes short of time directed on the package. At this time add beef back in, and let it cook the last 3 minutes with the lid on and turn down to low heat. When it is done, take your cornstarch/beef stock mixture, you may need to stir it again and add into the pot stirring slowly, it will start to thicken into a gravy almost immediately. When all combined, turn the heat off, put the lid on and let is sit 5 minutes. Then serve! Cooking the meat first leaves you great flavor to help flavor your stock! If you want a stronger beef flavor, through in a couple of beef bouillon cubes. I did just that myself. Sometimes I do and sometimes I don't. I don't feel like I got the BEST quality stock, so I wanted to bump it up just a hair. This can be added anytime, just make sure the cubes or granules are dissolved. I don't typically use bouillon because of the salt factor. I figured in a pot of food this big, a couple would not kill anyone and they really made just the right amount of difference. I would just watch the amount of salt you add, because there is so much in the bouillon. I hope on some chilly, rainy, snowy, or windy night.... No wait, on ANY night. You feed your family this belly warming dish! This is the official end of my "break". I should have had this typed up for you 2 days ago, but, I got lazy! Back to work my friends, enjoy your evening and thanks so much for being part of FoodThoughtsOfaChefWannabe! sounds yummy. I remember beef and noodles, but picky husband thinks only Chicken and noodles. So glad to have you here!! I hope you enjoy some great recipes!!! I look forward to hearing from you again!! Going to trade the beef out for elk steak. Should be good. Great I sea. Thanks! New here and excited to see te rest! So glad to have you! Let me know how it tastes with the elk steak! Thanks for reading! Definitely looks like something my husband would love. This sounds delish! Thank you for sharing it on Man Approved Monday, I would definitely say it's something that would be devoured in my house! Any preference on the cut of beef to be used? None at all, whatever you like best!